I wanted to make the original birthsigns a bit more fun and interesting to play. They are now more powerful than the original abilities/powers/spells, but are also balanced so as not to be overpowered. I wanted to make the original birthsigns a bit more fun and interesting to play. They are now more powerful than the original abilities/powers/spells because I felt that, at higher character levels, a birthsign could be replaced by a piece of enchanted clothing or a custom spell. Hopefully, the new abilities/powers/spells are also balanced and thus are not overpowering. I have drawn inspiration (directly, and modified) from Tyrthyllanos's 'Expanded Birthsigns for Purists' mod; also, I was inspired by Doy and IceNine0's 'The Definitive Birthsigns Pack' mod. !! !This mod does not appear to work correctly with existing characters. - 'EBforP' stands for "Expanded Birthsigns for Purists"
+ If the Power/Ability/Spell does not indicate the recipient of the spell (Target, Touch, Self), then assume that it means Self. + Some spell effects may be listed here with "pts" (points), but are indicated in-game as a percentage (%). + I have not play-tested all the signs to ensure balance. You have been warned! + This mod has been cleaned with TESTool. + There are two .esps (please see the Install section for instructions): one plugin is for people with Bloodmoon, the other is for those folks without Bloodmoon. The only difference between the two plugins is one of the Warrior Birthsign Powers. If you have Bloodmoon, you may choose which of the two plugins you want to use. If you only have Morrowind, do not use the plugin that requires Bloodmoon. !! !Please Note!!! : In character creation, you might not see all the Abilities/Powers/Spells listed in the preview panel. This is a limitation in the panel size; your new character will receive all the Birthsign effects listed below. 1.a. If you do not have Bloodmoon, copy the BirthsignsAMFun_MW.esp file to (install folder)\Morrowind\Data Files\. Do not install BirthsignsAMFun_BM.esp. 1.b. If you have Bloodmoon, you may choose to instead copy BirthsignsAMFun_BM.esp file to (install folder)\Morrowind\Data Files\. If you decide to use this .esp, do not copy the BirthsignsAMFun_MW.esp. 2. Start Morrowind Launcher, click 'Data Files', place a checkmark beside the .esp file. 1. Start Morrowind Launcher, click Data Files, uncheck the .esp file(s). 3. Start Morrowind and play. There is no effect on saved games and should not corrupt any saves. 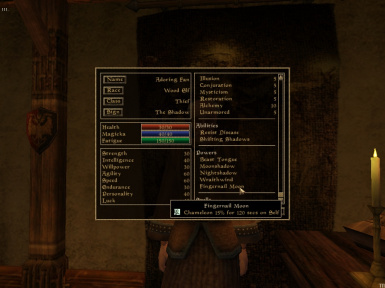 This mod will be incompatible with any mod that alters the Birthsigns. All powers have their own unique IDs (even the original TESIII powers have been recreated), so any mod that references the original powers will not use the modified powers in this mod. This mod does not appear to work correctly with existing characters (not all of the new abilities are applied correctly). Extensive testing has not been done, so maybe you will get lucky and it'll work. Do not use the RBirthsignsAMFun_BM.esp if you do not have the Bloodmoon expansion installed! None so far: send me a PM if you find anything! Don't blame me if your computer implodes. Always backup you save games when installing new mods. 1.0, 2008/m/d - Initial release. Thanks to the folks on the Bethesda forums for their input and support. Thanks to Bethesda for creating Morrowind, Tribunal, and Bloodmoon. Thanks to TESNexus.com for the one-stop-shop resource for authors and players. Thanks to Planet Elder Scrolls for hosting so many mods. Thanks to ghostwheel for making TESTool, with which this mod was cleaned.